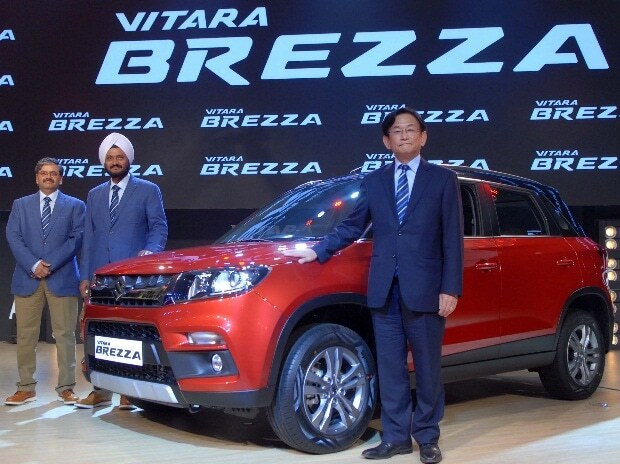 (From left to right) C V Raman, Executive Director, Engineering, R S Kalsi, Executive Director, Sales and Marketing and Kenichi Ayukawa, MD & CEO, Maruti Suzuki at the launch of Vitara Brezza in Mumbai Suzuki Motor Corp sharply raised its full-year profit forecast on Thursday, driven by strong sales at home and in India, its biggest market. The maker of the Baleno compact hatchback and the Vitara Brezza compact SUV (sports utility vehicle) dominates the Indian market through its majority stake in Maruti Suzuki India, the country’s largest automaker. Sales in India, which accounts for roughly half of the carmaker’s global vehicle sales, rose 19.4 per cent to 457,000 units during its second quarter ended September. In Japan, sales increased 6.2 per cent to 160,000 units. Suzuki said it now expected full-year operating profit of 300 billion yen ($2.6 billion), up from the previous forecast of 240 billion yen. It compares with an average estimate of 327.5 billion yen in a poll of 22 analysts. Operating profit at Japan’s No. 4 automaker came in at 87.8 billion yen in July-September, up from 56.3 billion yen a year ago and above an average forecast for 78.21 billion yen from 10 analysts polled by Thomson Reuters I/B/E/S. Strong sales of compact vehicles and SUVs bolstered Maruti’s operating profit during the second quarter. Last week, the Indian automaker reported an operating profit of Rs 2,480 crore, up slightly on the year and exceeding analyst forecasts. The automaker owns 56.2 per cent of Maruti, and gets the bulk of its revenues from the Indian partnership, which has a market value of around $30 billion, higher than Suzuki’s market capitalisation of about $20.5 billion. It expects the US dollar to trade around 111 yen, and the Indian rupee to trade around 1.7 yen in the year to March.